Chuck and Jeff share a rare serious moment. 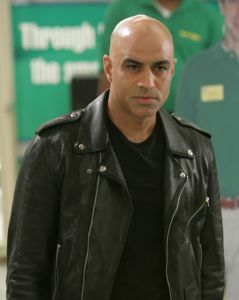 Farrokh Balsara [a/the bad guy]. 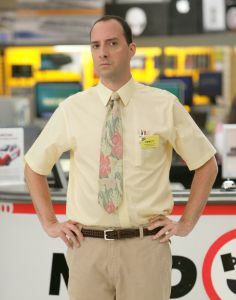 Efficiency expert turned assistant manager Emmett Milbarge. Chuck plays a classic arcade game. Chuck, Jeff and Anna react to something or someone. 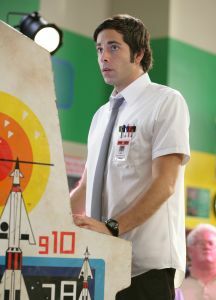 Chuck plays the arcade game as Emmett tries to distract him. 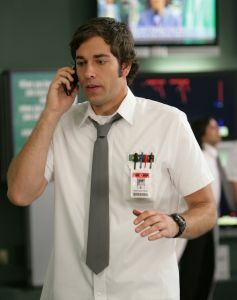 Chuck making one of his timely phone calls. Chuck and Emmett shake hands.